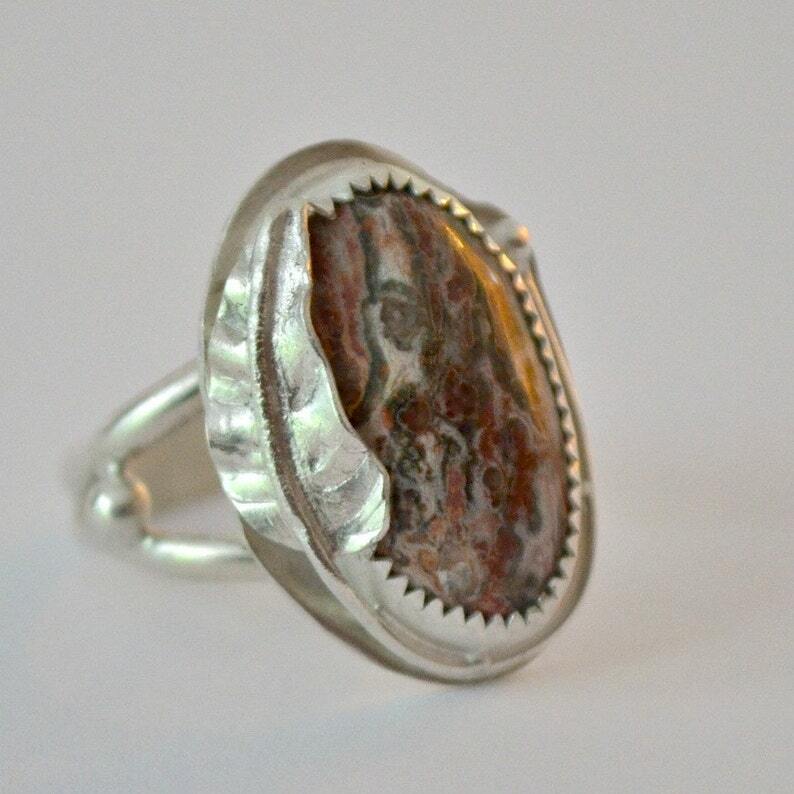 Sterling silver stone ring, entirely handmade from start to finish by me. Even the pink leopardskin jasper stone was cut and polished by me, in my studio. The setting is forged and torch soldered from raw sterling silver and fine silver. The style is a little 'art nouveau'. What could be better than a one of kind ring to last a lifetime? Candy for your fingers. Every piece on this ring, including the small leaf, was hand formed and torch soldered. It takes many steps to complete the ring before the stone can be secured and the final product polished. I gave this one a nice soft satiny finish. It is a size 6.5 and could be stretched close to a 7. I do take custom orders so if you like the style of this ring but see another stone in my shop, or have a special stone request, contact me for a custom made setting in your size. Something made JUST FOR YOU!! 100% satisfaction guaranteed. Love it or return it. rutilated quartz ring with opal effect. size 7 "intersection"
I love this ring! It is made so beautifully. I love the stone and the etched symbols on the band. I always keep an eye on this shop- she has great jewelry with really cool stones! Truly one of a kind pieces. Sterling silver and 14K gold filled wire wrapped bracelet. "Cosmopolitan"
BEAUTIFUL stone-amazing silver work and design-much attention to detail-a terrific statement piece! Always a joy to purchase from Terri who offers not only wonderful jewelry, but the best customer service, lovely packaging along with anti-tarnish pouch and polish cloth and information on care of the jewelry-thank you, thank you! Crazy Lace agate pendant with leaves and 18K balls. Great! Wonderful quality and weight. Super customer service. I needed it quickly and had it within the week. Men's Sailors Knot Link bracelet Heavy weight Sterling silver. All payments are made through Etsy payments using methods approved by Etsy. I do not see your information. The receipt in your account will show the payment was made to Etsy. If you don't love it - send it back. I will gladly refund the purchase price, less the original shipping and handling charge and a possible restock fee. Customer pays for return shipping and is responsible for it's safe delivery. VAT tax and any fees due on international shipments are collected by YOUR country upon receipt by you in your country. RETURNS: Item must be sent for return within 14 days of receipt and you must notify me through etsy within 48 hrs of receipt and ship with delivery confirmation. Contact me through Etsy please, from any listing page or use the email on your receipt. Time to return on items purchased for gifts begins when the gift is given IF you give me a date when purchasing (SEE BELOW). is eligible for full refund including shipping with proof of defect. Return of the item will be at seller's discretion. Domestic returns should be made by USPS First class mail with tracking and insurance and will be refunded up to $6.00 shipping. Insurance can be purchased at Insurepost.com for a reduced rate over the USPS insurance. REFUNDS: are made after receipt of the returned item. I want you to be happy with my jewelry. Please let me know if the item is a gift and the date you expect to deliver the gift and I will make an adjustment for the return time. INSURANCE: I do insure most packages through a 3rd party insurer. In order to refund or replace an item not received the insurer has certain requirements including: "The recipient, or for loss claims, the intended recipient, MUST assist in the claims process. They must sign an affidavit stating damage or non receipt". Therefore, as I'm sure you understand, I will need your cooperation and will be more than happy to refund/replace for lost in the mail merchandise when I have the affidavit from you. They also require that the recipient keep all packaging for damaged goods and may require photos. There may be a waiting period for lost packages. Thank you for your cooperation should the unthinkable happen. If, after reading my shipping policies below, you have any questions, please contact me and I will get back to you as soon as I can, usually within a few hours at most. I want purchasing from me to be a pleasant easy transaction for both of us and I try to list my shipping fees as close to my actual costs of materials and postage as I can. Some LOCAL PICKUP available. Contact me for details. My studio is private except for friends and family. All items purchased in an order with combined shipping will ship to the same address. If you want items shipped to separate addresses, they must be purchased separately to cover shipping. USPS by first class mail with delivery confirmation in padded envelope. I can fit 2 to 3 small boxed items into a padded envelope and offer priority mail upgrade option on most domestic shipments. Shipping outside the USA is done by First Class International Mail and that is the price that's quoted. Tracking is only available for limited countries and sometimes only for certain types of shipments. Delivery can take weeks. Please be patient. All foreign fees, customs charges, etc. are the responsibility of the purchaser. All prices listed are USD. Packages returned to me unclaimed will only be refunded for the merchandise. you may have additional collection fees such as in the UK where the postal system charges to collect the VAT tax. SHIPPING to a PO BOX: I will need your phone number to process the shipment. Please put it in the message to seller box. Failure to give me that will delay the shipping. Some countries REQUIRE insured priority or even registered for certain items. If your country is one of those I will contact you before shipping and may require an additional fee to ship. I will give you the option to cancel the sale if the fee is too much for you. Some countries don't allow my merchandise to be shipped to them. (For instance I can't ship sterling to Mexico). If you order from me and I'm prohibited from selling an item to your country, I will cancel the sale and refund any amount paid. If you have questions about the cost, it'll be better for both of us if you contact me BEFORE you purchase. PACKAGING: includes a gift box for each item and an anti-tarnish bag or strip for sterling silver or Gold filled items. For your safety, I will ship to the address you register with at the time of purchase. Please double check your address to avoid delays. TUTORIALS are available by instant download through Etsy. If you wish to have me send a paper copy, there is a small fee to cover expenses. Please note that not all monitors show colors the same and the colors on your monitor may differ slightly from the actual colors of the item. I try to take accurate photos that reflect the true colors. Different lights can affect stone colors making them more vivid. I am always happy to try to confirm a color for you. I make all of the items you see in my shop by hand, including many of the cabochon stones which are cut and polished in my studio. My home and studio are smokefree. All packaging materials are new. All jewelry is packaged in a gift box. Sizing for Bracelets - measure your wrist snugly at wristbone and add 3/4" for average fit. If you don't know your ring size, you can stop in any jewelry store and they will size you. It only takes a minute. I do take custom orders and can let you know at the time the order is placed how long it will take. I'm happy to quickly answer any questions. There are no stupid questions and I enjoy hearing from you. Can I get my order rushed? If I can accomodate you, I'd be happy to but please ask. Will my purchase be shipped insured? *If the refund involves insurance, contact me and I will give you instructions to complete the process. When insurance is approved I will refund you. *If the refund is from a defect - I will instruct you whether to return or send me a photo confirmation prior to refund. Silver Butterfly ring. Sterling silver. "fly free"
Adjustable thumb ring. Sterling silver adjustable ring. sterling silver square link earrings. Hand made. Dichroic glass flower earrings in solid sterling silver setting.